Beginning teachers’ induction into the teaching profession needs to be personally and professionally fulfilling, which is often not the case. 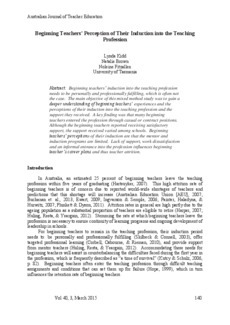 The main objective of this mixed method study was to gain a deeper understanding of beginning teachers’ experiences and the perceptions of their induction into the teaching profession and the support they received. A key finding was that many beginning teachers entered the profession through casual or contract positions. Although the beginning teachers reported receiving satisfactory support, the support received varied among schools. Beginning teachers’ perceptions of their induction are that the mentor and induction programs are limited. Lack of support, work dissatisfaction and an informal entrance into the profession influences beginning teacher’s career plans and thus teacher attrition.